There’s a disclaimer at the start of this cinema classic stating that all events and characters are purely fictitious. The renown director, Jean Renoir even introduces the DVD release with a voice-over re-iterating this point. But what no-one attempts to deny is the veracity of the drawn out hunting sequence. Animals were harmed during the making of this film. Pheasants plummet in great numbers from the skies while rabbits tumble to the ground after being flushed from their forest sanctuary by a line of smocked servants beating trees to herd the creatures towards certain death at the hands of their aristocratic masters. It’s not a pretty sight but it graphically illustrates the division of classes in pre war France and some of the ridiculous rules that governed it. Christine de la Chesnaye (Nora Gregor) “belongs to society and the rules are strict”, as her childhood friend Octave is quick to point out. Renoir himself plays the cheeky Octave, mediating between the luminous Christine and her overly smitten admirer, Andre Jurieux (Roland Toutain), who we meet at the start of the film having just flown across the Atlantic in an attempt to win her heart. But Christine is married to Robert (Marcel Dalio) and the rules require that she keep up appearances to that effect despite the fact that he is conducting an affair with the eccentric Genevieve (Mila Parely). Often verging on the farcical, this expose of French society keeps its cool by regularly revealing elements of tragedy within the emotional lives of its many and varied characters. The ‘upstairs/downstairs’ scenario recalls Robert Altman’s Gosford Park (which also featured an impressive shooting party sequence) but while that film held firm to the murder mystery genre, this slick predecessor is much more ambivalent. Nevertheless, the French Government saw evidence enough to ban it from cinemas just one month after its release. And later, the occupying Nazis also took offence, burning every print they could lay their hands on. That we can even see it today is a small miracle as it was reconstructed from remnant bits of celluloid scattered all over France. 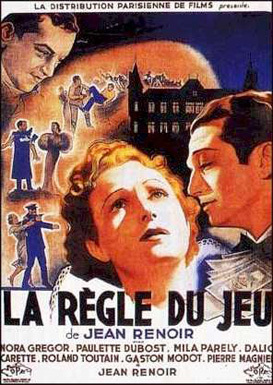 La Regle Du Jeu or Rules of the Game carefully captures a society destined to implode as a warning, perhaps, to those that would follow.